Eight Harleys and eleven Brittany-bound bon viveurs. Triumphant to reach the Portsmouth ferry bone-dry, we headed straight for the bar and restaurant. Friday. I thought only England could be that kind of colour grey... come the day, it utterly hissed it down. Pah, no worries - veterans of the Gascony ’04 and St. Tropez ’05 runs, we were undeterred. 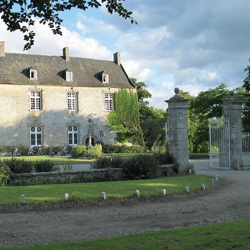 By late afternoon we were weaving through Brittany’s beguiling green patchwork countryside-quilt, on to Plancoet and then crunching up the long driveway to the manoir, a sight for sore wet eyes. Monsieur Even O’Neil, proprietor, was there at the stone doorway to watch us rumble through the gates into the courtyard. Manoir Vaumadeuc, circa 1400s, was home to a noble family and the vast grounds would hear the massive bell calling them to dinner... only now to be rung by our own Dietmar when his glass ran dry. You can picture, all those years ago, French knights in shining armour on horseback, arriving in great splendour... now replaced with immaculate chrome, leather and steel. After a long soak, short kip... dry, and very hungry, we abandoned plans for a rumble into the nearby town for dinner, and opted instead for luxury limos to convey us there and back. How do they do it? Such good food and wine and so inexpensive, the rain a fuzzy memory. Saturday. Blue skies, fluffy white clouds - sorry, nuage blanc. Breakfast was long and lazy before a late foray into the countryside. 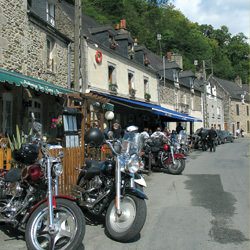 Dinan’s quaint and quintessential inland port is too seductive to pass by and, with our steeds safely parked, we nestled down for lunch. Saturday dinner... a seafood fest. 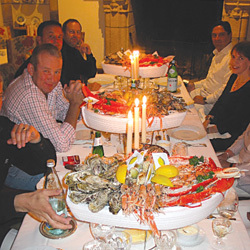 There were armies of prawns, battalions of whelks, platoons of oysters and regiments of langoustines. But the Major-General lobsters were something else! I shall say little more than to relate that the evening flowed nicely, nicely into sleep and onto yet another lazy breakfast. We loaded our Harleys in the sunshine to point north west. We just had to stop in Honfleur for lunch by the oft-painted chocolate-box port. Too much enjoyment saw the fastest mass motorcycle dash across the very lofty Pont De Normandie and onto the ferry. We came skidding to a halt in the Club Lounge to a tray of free champagne. Salut! If you’re interested in taking part in any of the great activities we’ve got planned for 2006, get along to a Warr’s dealership and pick up a free schedule of events postcard.